Spirit Camera: The Cursed Memoir- Augmented Reality Done Right? Nintendo delivers a compelling AR demo. Let's hope the rest of the game is just as good. Both Augmented and Virtual Reality share a common thread of not living up to the hype, especially the former, which relies on cards and gimmicks that feel more like parlor tricks. Fun to look at for ten minutes, but too shallow to grab a person's attention for considerable lengths of time. Spirit Camera: The Cursed Memoir may change that. Although my time with it was brief, I had trouble putting this spooky adventure down. What separates this title from the rest is a heavier emphasis on the single player experience, instead of shoehorning player faces onto characters or boring them to tears with collections of mini-games. It begins with the premise, which is essentially Fatal Frame with a camera; no surprise, since the developers behind that critically acclaimed series worked on this game. 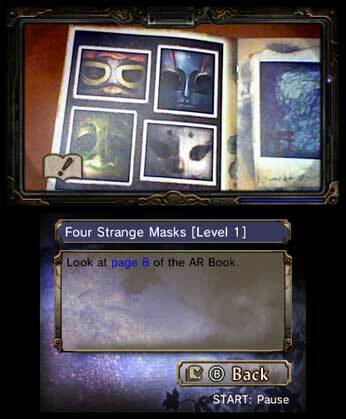 A scary woman in black with a penchant for stealing her victims' faces has captured a young girl named Maya, and it's your mission to rescue her using the 3DS (err...Spirit Camera) and the dangerous Diary of Faces, a booklet that comes with each copy of the game. From what I can tell, most of the experience is on rails, as the hero cannot physically walk, but you can tilt the 3DS to examine your surroundings, which is cool. Not only that, but the developers do some impressive things with the camera and the book. Place the viewfinder over a blank page and watch words mysteriously appear, or a man's face vanish, replaced by stitches covering his eyes and mouth. 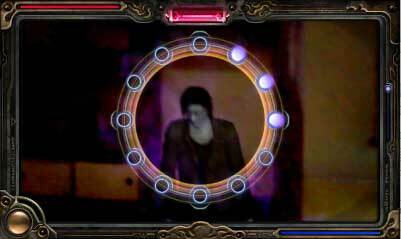 Gameplay, meanwhile, is very Fatal Frame. Ghosts wander around the "real world", and it's your job to locate the suckers (again using the 3DS gyro), line them up and then wait for a Shutter Chance, where a series of blue orbs light up in rapid succession and the screen temporarily turns red. Once that happens, you press L or R to attack, essentially inhaling the apparition's essence. Not exactly the most original concept, but I must admit, waiting for that Shutter Chance to appear (right before the ghost strikes) is quite intense. Unfortunately, I had to put the game down prematurely, but this small taste of Spirit Camera: The Cursed Memoir had me hooked. I'll find out if Nintendo delivered the AR game fans deserve when it debuts Friday, April 13.